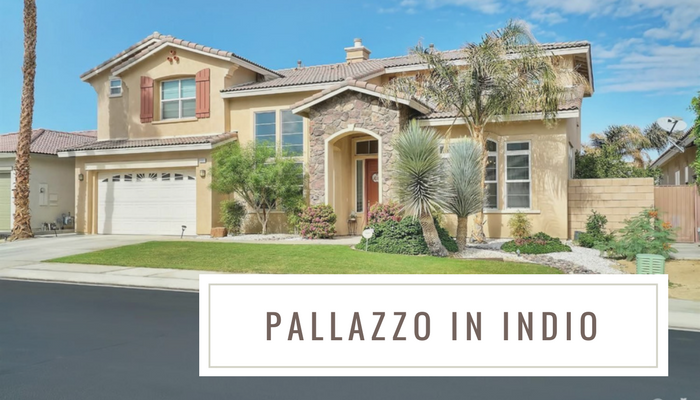 Located just off of Monroe Street north of Avenue 42 in Indio California is the gated community of Palazzo. Most of the homes were built within the last 10 years by Woodside homes and there are homeowners dues of about $85 per month. These dues cover landscaping in common area maintenance. This prestigious and private gated community offers several different home styles as well as different levels and layouts. Most homes are either three, four or five bedroom floor plans and feature open spaces, fireplaces, vaulted ceilings and formal dining rooms. Most homes feature a two-car garage. Homes in Palazzo range from about $330,000-$420,000. Several homes have gorgeous backyards with swimming pools or outdoor entertainment spaces and there are single-story and two-story models. Homes are between 1800 - 3,000 Square feet. Residents are part of the Desert Sands Unified school district and are utilize the Ronald Reagan Elementary school, the Desert Ridge Academy and the shadow Hills high school all between 2 1/2 and 4 1/2 miles from this community. The Indio town Center is less than a couple miles from this community. I-10 is just down the street with easy access but far enough to muffle any traffic sounds. If you're interested in the Palazzo community, view all listings here or contact our office today for more details and to schedule a showing.